With another morning’s worth of diving on the agenda for me today, it was going to be another gruelling early start to my day. Once again, I somehow managed to be awake and sufficiently alert so as to disable the 07:00 alarm before it sounded, which also meant that I was able to make my ninja-stealth-like getaway without disturbing Sandy and the kids. As it turned out, Sandy was already partially awake herself and even managed to ask me if I was awake already. The three of them apparently managed another half hour’s sleep after I had left. Down at the breakfast hall, I topped up with generous portions to accommodate for the day ahead of me and then made my way over to the reception for my 07:45 taxi pick-up. By 7:55, the taxi still hadn’t arrived so the porter, who knew I was waiting for a taxi to the dive school (they always seem to know everything), called the dive school to see where the taxi was. An apparent misunderstanding between the dive school and taxi company was the source of the problem but this was swiftly resolved and the same taxi driver from a couple of days ago showed up within a couple of minutes. ￼Once at the dive school, I kitted up along with a small group of other divers and was pleasantly surprised to see that we were to be catching the dive launch right there from the beach at the dive school this time. Our trip out to the dive site was literally just a couple of minutes. The two dive sites that I was to be diving today were Casper and Bordello. I was hoping that these would be improvements on the previous dive sites I visited a couple of days ago and I was not disappointed. Both dives were indeed very much better. Towards the very end of the first dive, I caught site of a nice Moray eel right beneath where the boat was moored to the buoy line. The second dive in particular was full of interesting marine life and much more variety in soft corals. To top it all off, we encountered two turtles towards the end of the dive. One of the local Fijian dive masters ‘captured’ one and was posing with it for photos for an American couple. Along with another diver, I was not impressed with this at all. I’d much prefer to observe the marine life in it’s natural habitat and a SCUBA clad diver does not qualify as natural habitat for a sea turtle. Several times during this dive, I had some difficulty with equalising. This manifested itself as intense, sharp pain in my left eye. I had to ascend a couple of meters on a few occasions to resolve the blockage before descending again but I made it through the dive otherwise with no ill effects. For both dives, I tried my best to conserve my air longer by remaining a few meters above everyone else. Somehow, however, I still managed to be the first diver to reach the 50 bar mark. One of the divers found what I thought was a flatworm but I was later told that it was a Spanish Dancer Nudibranch. The same diver that captured the turtle also picked this beautiful little marine creature up, again it seemed, to show to the Americans. ￼There was plenty of diverse fish this time around, including a huge trigger fish. The second dive included a wall that was pretty much vertical and had just the most wondrous array of soft corals all up and down it’s length - just amazing. I was gutted not to have a camera with me. having said that, however, there was quite a hefty swell back and forth and it would have been very difficult to keep the camera in one spot long enough o local focus anyway. Once we were back at the dive school, the American woman that had a camera with her told me that she looked up at one point and noticed the turtles swimming above me and so she took a shot of me with the turtles in the background from her lower vantage point. We exchanged contact details and she has agreed to e-mail me the photo. Back at the Outrigger, I found Sandy and the kids relaxing at the bure. We had had cloud cover for pretty much all of the day and so, although still warm, it wasn’t really pool lounging weather. We decided to have lunch at the Sundowners restaurant and so wandered over there. The meal was very good, again, but Joey was being rather non-cooperative and this was raising the stress levels just a tad. 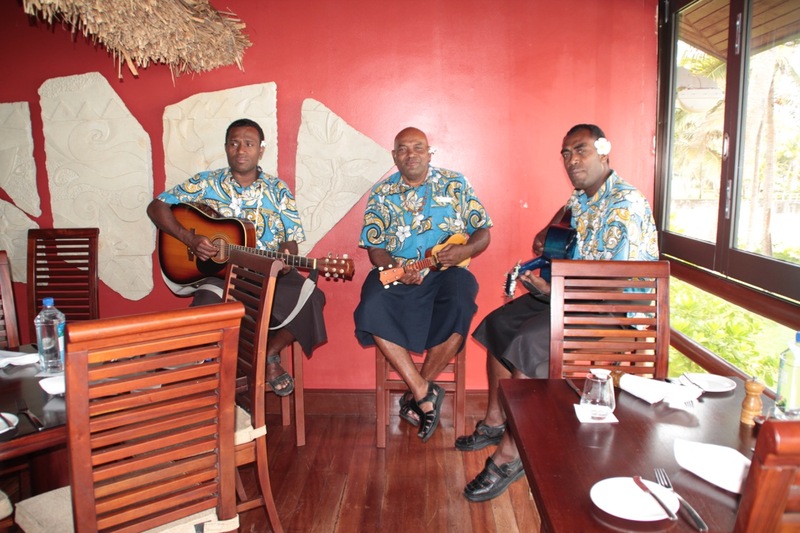 We did enjoy the three Fijian musicians that were sitting in the corner playing soft, Fijian style music. At one point, Joey was trying his best to use Sandy’s camera to take a photograph of them. It was actually quite humorous watching him trying to locate the image of his subject in the viewfinder - even though the camera was pointing more towards the ceiling than anywhere else. This made the musicians chuckle also. As we were sitting to lunch, we noticed a couple of fishermen using a weighted net casting for fish. Sandy and the kids went out onto the lagoon (it was low tide) to see what they had caught, which turned out to be a near full bucket of good sized fish. ￼By this time, it was clear that everyone was extremely tired, and so we all thought that a quick nap back at the bure would be a good idea. Naturally, and perhaps somewhat predictably, the kids gave up on this idea pretty much as soon as we got there and so Sandy took them over to the pool whilst I did my best to have a nap. Unfortunately, Jennifer came knocking on the door pretty much every 4-5 minutes claiming that there was something else that she had forgotten to take and now desperately needed. Each time she knocked on the door, I had just about reached a state of semi-consciousness. I think it was about the 5th visit, this time with Sandy, that just about sent me over the edge and I was in a grumpy mood for much of the remainder of the afternoon. I decided that the best thing was for me to find some space so I got my things ready for this evening’s planned night dive and wandered over to the cafe next to the main reception desk, where there are apparently some laptops where I could have a quick session on the Internet. I managed to kill about half an hour doing this until my taxi arrived for the night dive. This time, the launch would be departing from it’s usual beach location just up the road from the dive school. After the obligatory dive briefing, where my new dive master for this trip would refresh my memory on all the dive signals that involve the use of a torch. There were 4 staff members accommodating me, the only customer, for this single dive. I mentioned that I felt somewhat guilty about this but the dive master insisted that it was all part of keeping the customer happy. I was to have a dive buddy in addition to a dive master (3 divers altogether) and the boat captain who would remain at the surface in the boat for safety reasons. ￼The trip to the dive site after we all got into the launch couldn’t have been more than 30 seconds. We descended to a shallow 4-5 meters and meandered along the floor. We never got any deeper than around 17 meters and most of the dive was around the 10 meters depth. I was absolutely thrilled with this dive, which turned out to be the best by far since arriving in Fiji. The nice thing about night dives is that all manner of creatures that you otherwise wouldn’t necessarily see come out into the open. I saw 2 Moray eels (one of which was only a baby), some huge puffer fish resting on the seabed, various hermit crabs with anemones growing on their shells scurrying about, an octopus, some stone fish, an anemone crab and lots of different shrimps of varying colours and decorations. Apparently, a shark and manta ray swam very close past me but the 3rd diver was too far away at the time to attract our attention to them in time and so I missed out on actually seeing those. ￼I was also very much more comfortable in the water this time with better buoyancy control and air consumption. Now, this one night dive, if memory serves, only cost me something like $120 Fijian Dollars or thereabouts. I don’t know how much of that went to the dive school but there couldn’t have been much left over for the 4 Fijian dive school staff, who are paid in situations like this by the hour. Although it’s not customary to tip here in Fiji, I asked nevertheless of they would be offended if I did so and was pleased that they very graciously accepted a $100 Fijian Dollar tip from me to split between the four of them. I have no idea if this is a lot or a litter from their point of view but they all seemed very pleased and very thankful.